This Spring I’ve been visiting one of my favourite locations several times – it’s a bit of hidden gem. From the road it looks like a small cluster of trees surrounded by farming land and bridleways. But take just a few short steps into the woodland and the beauty is breathtaking. Set in a private ancient woodland, there’s a carpet of native bluebells nestling beneath the trees. Emerging mid to late April they should last until the end of May. However, they can be very unpredictable little things. No year is the same, it’s as if these flowers enjoy keeping us on our toes. Last year appearing quite early due to the mild weather and this year, due to the cold snap they’ve kept us waiting a little longer. Because of the unpredictable Spring weather I’ve been on bluebell watch and visiting the copse several times over the past few months. It’s no chore watching the woodland waking as Spring crept closer. Firstly with the arrival of the snow-like covering of white anemones, now the blue haze of the bluebells which will soon to be followed by flourishing primroses and buttercups. Each year I offer mini photography sessions to coincide with the arrival of the bluebells. There’s pathways to be followed, hideaway dens to be discovered, woodland fairies to listen out for, butterflies to be spotted and horses gently meandering along the bridlepath running beside the woodland. It really is a magical setting. 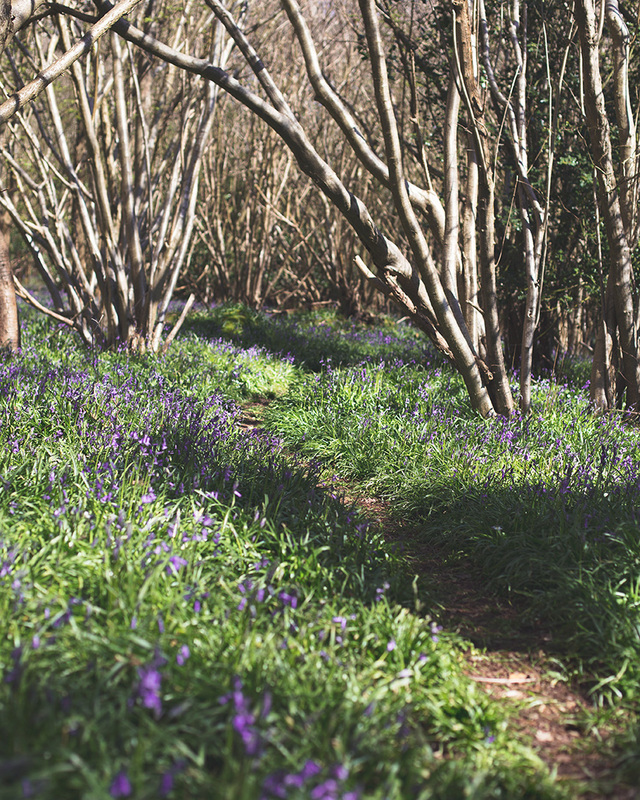 Manor Farm Country Park, Bursledon | Head to the north side of ‘Docks Copse’ on the last side of the park for an impressive bluebell display running along either side of the path. Durley Mill, Botley | Located between Durley and Curdridge the woodland around the river at the mill is packed with bluebells. From the B3035 between Bishop’s Waltham and Curdidge turn down Calcot lane at the duck pond. Go under the old railway bridge and take the next left. Park in the lay-by after the bend in the road. Head up the slope and through the gate at the top of the small ridge. Micheldever Wood, Winchester | With marked paths through the forest along with cycling trails it’s a beautiful setting to enjoy the carpets of bluebells. Hinton Ampner, Arlesford | Follow the circular route from the carpark leading to the heart of the ancient woodland surrounding this quintessentially English landscape. Hinton Ampner’s National Trust woodland is covered with bluebells as far as the eye can see -stroll slowly through glorious beech avenues and soak up the bluebell phenomenon. Looking further afield? Visit the National Trust’s bluebell page to discover more bluebell woods across the UK. Incase you are wondering, my Seasonal mini sessions are the perfect way to refresh your family photographs between full sessions. Availability is limited so to avoid disappointment, register as a VIP and receive early notification of mini sessions as soon as booking is open. Moira is a Southsea photographer who works throughout Hampshire and the UK. She specialises in children and families and is a member of the British Association of Professional Child Photographers. For more details visit her website or facebook pages.